The Yishuv (Hebrew: ישוב‎‎, literally "settlement") or Ha-Yishuv (the Yishuv, Hebrew: הישוב‎‎) is the term referring to the body of Jewish residents in the land of Israel (corresponding to Ottoman Syria until 1917, OETA South 1917-1920 and later Mandatory Palestine 1920-1948) prior to the establishment of the State of Israel. The term came into use in the 1880s, when there were about 25,000 Jews living across Land of Israel, then comprising the southern part of Ottoman Syria, and continued to be used until 1948, by which time there were about 700,000 Jews there. The term is used in Hebrew even nowadays to denote the Pre-State Jewish residents in the Land of Israel. A distinction is sometimes drawn between the Old Yishuv and the New Yishuv: The Old Yishuv refers to all the Jews living there before the aliyah (immigration wave) of 1882 by the Zionist movement. The Old Yishuv residents were religious Jews, living mainly in Jerusalem, Safed, Tiberias and Hebron. Smaller communities were in Jaffa, Haifa, Peki'in, Acre, Nablus, Shfaram and until 1779 also in Gaza. In the final centuries before modern Zionism, a large part of the Old Yishuv spent their time studying the Torah and lived off Ma'amodot (stipends), donated by Jews in the Diaspora. The New Yishuv refers to those who began building homes outside the Old City walls of Jerusalem in the 1860s, to the establishers of Petah Tikva and the First Aliyah of 1882, followed by the founding of neighbourhoods and villages until the establishment of the State of Israel in 1948. The Old Yishuv were the Jewish communities of the southern Syrian provinces in the Ottoman period, up to the onset of Zionist aliyah and the consolidation of the New Yishuv by the end of World War I. As opposed to the later Zionist aliyah and the New Yishuv, which came into being with the First Aliyah (of 1882) and was more based on a socialist and/or secular ideology emphasizing labor and self-sufficiency, the Old Yishuv, whose members had continuously resided in or had come to Eretz Yisrael in the earlier centuries, were largely ultra-orthodox Jews dependent on external donations (Halukka) for living. The Old Yishuv developed after a period of severe decline in Jewish communities of the Southern Levant during the early Middle Ages, and was composed of three clusters. The oldest group consisted of the Ladino-speaking Sephardic Jewish communities in Galilee and the Judeo-Arabic speaking Musta'arabim who settled in Eretz Yisrael in the Ottoman and late Mamluk period. 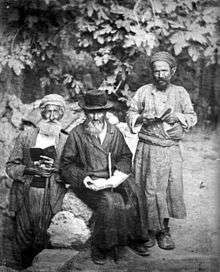 A second group was composed of Ashkenazi and Hassidic Jews who had emigrated from Europe in the 18th and early 19th centuries. A third wave was constituted by Yishuv members who arrived in the late 19th century. The Old Yishuv was thus generally divided into two independent communities – the Sephardim (including Musta'arabim), mainly constituting the remains of Jewish communities of Galilee and the four Jewish holy cities, which had flourished in the 16th and 17th centuries; and the Ashkenazim, whose immigration from Europe was primarily since the 18th century. The 'Old Yishuv' term was coined by members of the 'New Yishuv' in the late 19th century to distinguish themselves from the economically dependent and generally earlier Jewish communities, who mainly resided in the four holy cities of Judaism, and unlike the New Yishuv, had not embraced land ownership and agriculture. Apart from the Old Yishuv centres in the four holy cities of Judaism, namely Jerusalem, Hebron, Tiberias and Safed, smaller communities also existed in Jaffa, Haifa, Peki'in, Acre, Nablus and Shfaram. Petah Tikva, although established in 1878 by the Old Yishuv, nevertheless was also supported by the arriving Zionists. Rishon LeZion, the first settlement founded by the Hovevei Zion in 1882, could be considered the true beginning of the New Yishuv. The Ottoman government was not supportive of the new settlers from the First and Second Aliyah, as the Ottoman government officially restricted Jewish immigration. The Yishuv relied on money from abroad to support their settlements. In 1908 the Zionist Organization founded the Palestine Office, under Arthur Ruppin, for land acquisition, agricultural settlement and training, and later for urban expansion. The first Hebrew high schools were opened in Palestine as well as the Technion, the first institution for higher learning. Hashomer, a Zionist self-defence group, was created to protect the Jewish settlements. Labor organizations were created along with health and cultural services, all later coordinated by the Jewish National Council. By 1914, the old Yishuv was a minority and the new Yishuv began to express itself and its Zionist goals. The Zionist movement tried to find work for the new immigrants who arrived in the Second Aliyah. However, most were middle class and were not physically fit or knowledgeable in agricultural work. The Jewish plantation owners had previously hired Arab workers who accepted low wages and were very familiar with agriculture. The leaders of the Zionist movement insisted that plantation owners (those who arrived in the First Aliyah) only hire Jewish workers and grant higher wages. The conquest of labor was a major Zionist goal. However, this caused some turmoil in the Yishuv for there were those who felt that they were discriminating against the Arabs just as they had been discriminated against in Russia. The Arabs became bitter from the discrimination despite the small number of Arabs that were affected by this. The First Aliyah was the very beginning of the creation of the New Yishuv. More than 25,000 Jews immigrated to Palestine. The immigrants were inspired by the notion of creating a national home for Jews. Most of the Jewish immigrants came from Russia, escaping the pogroms, while some arrived from Yemen. Many of the immigrants were affiliated with Hovevei Zion. Hovevei Tzion acquired land from Arabs and other Ottoman subjects and created various settlements such as Yesud HaMa'ala, Rosh Pinna, Gedera, Rishon LeZion, Nes Tziona and Rechovot. These agricultural settlements were supported by philanthropists from abroad, chiefly Edmond James de Rothschild. and Alphonse James de Rothschild. Eliezer Ben-Yehuda also immigrated during the first Aliyah. Ben-Yehuda took it upon himself to revive the Hebrew language, and along with Nissim Bechar started a school for teaching Hebrew, later on founding the first Hebrew newspaper. During the Second Aliyah, between 1903 and 1914, there were 35,000 new immigrants, primarily from Russia. During World War I, the conditions for the Jews in the Ottoman Empire worsened. All those Jews who were of an enemy nationality were exiled and others were drafted into the Ottoman army. Many of those exiled fled to Egypt and the United States. Those who remained in the Ottoman ruled Palestine faced hard economic times. There was disagreement whether to support the British or the Turks. A clandestine group, Nili, was established to pass information to the British in the hope of defeating the Ottomans and ending their rule over Palestine. The purpose and members of the Nili were discovered. All involved were executed by the Ottomans except its founder, Aaron Aaronsohn, who escaped to Egypt. During World War I, the Jewish population in Palestine diminished by a third due to deportations, immigration, economic trouble and disease. During World War I, there were two British battalions of Jews, called the Zion Mule Corps, who were to fight on the front of Palestine. They helped in the British capture of Ottoman Syria (including Palestine), leading to the Turkish surrender. The members of the Zion Mule Corps later made up the Yishuv's defence groups that would fight against the British. World War I ended, along with the Ottoman Empire. Britain gained control of Palestine through the Sykes-Picot Agreement, which partitioned Ottoman Syria into French-ruled Syria and Lebanon and British-controlled Palestine and Transjordan. There was a hope that British control would allow the creation of a Jewish national homeland as promised in the Balfour Declaration. The British Mandate was formalized in 1922 based on the Balfour Declaration. The British were supposed to help the Jews build a national home and promote the creation of self-governing institutions. The mandate provided for an agency in which the Jews could represent Jewish interests and promote Jewish immigration. It was called the Jewish Agency for Palestine, and was only created ten years later, serving as the de facto government of the Yishuv. Along with a Jewish agency there was to be a general self-governing institution created in Palestine including Jews and Arabs. The Yishuv feared such an institution due to the Arab majority, but none was created in the end due to the Arabs' refusal to cooperate with the Jews or British. The optimism that existed in the beginning of the British mandate soon diminished due to continued hardships in the Yishuv. Most of the European funds that supported the Jewish settlements before World War I ended. The Arabs, opposed to the Balfour Declaration and the Mandate, instigated riots against the Jews. The British limited immigration through yearly quotas; only those who received "certificates" could make Aliyah. In 1919 the first nationwide women's party in the New Yishuv (the Union of Hebrew Women for Equal Rights in Eretz Israel) was created, and Rosa Welt-Straus, who had immigrated there that year, was appointed its leader, as which she continued until her death. In 1926 the haredim, who preferred not to face the possibility of a plebiscite, left the yishuv's Assembly of Representatives, and that year an official declaration was made (ratified by the mandate government in 1927) confirming "equal rights to women in all aspects of life in the yishuv - civil, political, and economic." There were Arab riots throughout 1920-21 in opposition to the Balfour Declaration. The Arabs tried to show the British the instability of Palestine and that a Jewish homeland was ungovernable. Riots increased in 1929 after the fourth Aliyah – 133 Jews were killed by Arab mobs during the 1929 riots. The Arabs claimed that Jewish immigration and land purchases were displacing them and taking their jobs away. These riots were also instigated by false rumours that the Jews were planning on building a synagogue near the Western Wall. These riots led to the evacuation of Hebron's indigenous – largely non-Zionist – Jewish population. The British responded to the Arab riots with the White Paper of 1939. It was based on the Hope Simpson Report, which stated that Palestine after economic development could support only 20,000 more immigrant families without infringing on the Arab population's placement and employment. It therefore attempted to curtail immigration to Palestine. Upon Jewish criticism of this policy, it was clarified that immigration would not be stopped entirely but would be restricted by quotas. There were many Jewish immigrants that arrived throughout the 1930s in the fifth Aliyah, despite the immigration quotas. Many who came were fleeing persecution in Eastern Europe. Those that came from Nazi Germany were able to come because of the Haavara Agreement. This allowed Jews to escape from Germany to Palestine in return for paying a ransom to the Reich. By then, the Yishuv had a population of about 400,000. The increasing numbers of Jewish immigrants and land purchases, unchallenged by the British Mandate, angered and radicalized many Arabs. In April 1936, Arabs attacked a Jewish bus, leading to a series of incidents that escalated into a major Arab rebellion. The British were caught by surprise and were unable to prevent the deaths of thousands of Arabs and hundreds of Jews in the revolt. The Haganah protected the Yishuv's settlements while the Irgun, a more radical group, attacked Arab settlements. A coalition of recently formed Arab political parties formed the Arab Higher Committee (AHC). It declared a national strike in support of three basic demands: cessation of Jewish immigration, an end to all further land sales to the Jews, and the establishment of an Arab national government. The Arabs threatened that if the British didn't comply with their demands then they would join the adversaries of the British. This concerned the British for World War II was just beginning and they knew they would need Middle Eastern oil. The British worked with their Arab allies to bring a halt to the AHC riots. The Peel Commission reported, in July 1937, that the British obligations to the Arabs and Zionists were irreconcilable and the mandate unworkable. It suggested the partition of Palestine into Arab and Jewish states, with the British mandate governing over Nazareth, Bethlehem, and Jerusalem along with a corridor from Jerusalem to the coast. 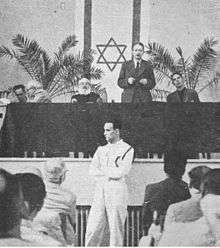 The Jews accepted the general principle of a partition while the Arabs refused any partition plan. The British government sent a technical team called the Woodhead Commission to detail the plan. The Woodhead Commission considered three different plans, one of which was based on the Peel plan. Reporting in 1938, the Commission rejected the Peel plan primarily on the grounds that it could not be implemented without a massive forced transfer of Arabs (an option that the British government had already ruled out). With dissent from some of its members, the Commission instead recommended a plan that would leave the Galilee under British mandate, but emphasised serious problems with it that included a lack of financial self-sufficiency of the proposed Arab State. The British Government accompanied the publication of the Woodhead Report by a statement of policy rejecting partition as impracticable due to "political, administrative and financial difficulties". The Arab Revolt broke out again in the autumn of 1937. The British ended the revolt using harsh measures, deporting many Palestinian Arab leaders and shutting down the AHC. In the Yishuv, the Arab Revolt reinforced the already firm belief in the need for a strong Jewish defence network. Finally, the Arab agricultural boycott that began in 1936 forced the Jewish economy into even greater self-sufficiency. The Haganah during this period changed from being a small clandestine militia to a large military force. The British security forces at this time cooperated with the Haganah to respond to the Arabs. In 1938 Captain Orde Wingate created the Special Night Squads (SNS) that were composed mostly of Haganah members. SNS used the element of surprise in night raids to protect the Jewish settlements and attack the Arabs. The British suppressed the Arab revolt and published the White Paper of 1939. It allowed for a total of only 75,000 Jews to enter Palestine over a five-year period. During this time the Yishuv entered a period of relative peace with the Arabs. The Yishuv wanted to help their fellow Jews, who were being murdered by the Nazis in Europe. Many Jews from Europe were prevented from fleeing to Mandatory Palestine by strict immigration quotas established by the white papers. The Jewish Agency organized illegal immigration from 1939 through 1942 with the help of the Haganah. Those who arrived illegally to Israel during this time were part of the Aliyah Bet. This was a dangerous operation, for these illegal immigrants arrived by boat and had to be careful not to be caught by the British or Nazis. Many of these ships sank or were caught, such as the Patria, Struma and Bulgaria. Compared with the number of attempts, few ships actually arrived successfully to Mandatory Palestine, but tens of thousands of Jews were saved by the illegal immigration. The Yishuv also wanted to help on the front lines in Europe to try to save Jews from the Nazi atrocities. In 1942 the Jewish agency turned to the British to offer their assistance by sending Jewish volunteers to Europe as emissaries of the Yishuv to organize local resistance and rescue operations among the Jewish communities. The British accepted the proposal but on a much smaller scale than the Jewish agency had hoped. They only took Jewish parachutists who were recent immigrants from certain targeted countries that they wanted to infiltrate. The British Special Forces and military intelligence both consented to the volunteers' dual role as British agents and Jewish emissaries. 110 Yishuv members were trained; however only 32 were deployed. Many of them succeeded in helping the POWs and uprisings in the Jewish communities, while others were caught. There were two periods during the war when the Yishuv faced a direct threat from Nazi forces. The first occurred following Germany's conquest of France in 1940, since the pro-Nazi Vichy regime controlled the northern Levant, from which an invasion of Palestine could take place. However, in 1941 British forces successfully fought Vichy forces for control of Syria and Lebanon, thus removing the threat of invasion from the north, at least as long as German armies in Eastern Europe could be held back by the Red Army and thus unable to easily advance towards the Near East from the north. In 1942 however, as Erwin Rommel's Afrika Korps swept across North Africa with the intent of capturing the Suez Canal, the likelihood of a German invasion from the south became a real possibility, causing great anxiety in the Yishuv and prompting plans to be drawn for its defense. Knowing that Nazi control of Palestine meant certain annihilation of the Yishuv, a debate raged among Yishuv leadership whether, in the event Nazi occupation was to take place, the inhabitants of the Yishuv should evacuate together with British forces eastwards towards British possessions in Iraq and India or undertake a Masada-like last stand in Palestine, likely doing so in a fortified zone to be hastily constructed around the Carmel Mountains. This military operation was officially named Palestine Final Fortress. Fortunately for the Yishuv, the advance of German forces eastwards in Egypt was halted during the Second Battle of El Alamein, thus lifting the threat of invasion from the south. The anxious time leading to the Nazi loss at El Alamein became known as the 200 days of dread. Despite the reports of Nazi atrocities and the desperation of Jews needing a safe haven the British kept the gates of Palestine almost closed to Jewish immigration. The Zionist leaders met at the Biltmore Hotel in New York in May 1942 and called for unrestricted Jewish immigration and the establishment of a Jewish commonwealth. Hundreds of thousands of Holocaust survivors were being held in Displaced Persons Camp (DP Camps) aching to go to Mandatory Palestine. The British received much international pressure, specifically from U.S. president Harry Truman, to change their policy on immigration. Despite Britain's dependence on American economic aid, the British refused, claiming that they were experiencing too much resistance from the Arabs and Jews already in Palestine and feared what would happen if more were allowed to enter. The refusal to remove the white paper policy angered and radicalized the Yishuv. The Yishuv's militia groups set out to sabotage the British infrastructure in Palestine and continue in their illegal immigration efforts. In 1946, the British responded to the Yishuv's efforts and began a two-week search for Jews suspected of anti-British activities, arresting many of the Haganah's leaders. While the British were busy looking for the Haganah, the Irgun and Lehi carried out attacks on British forces. The most famous of their attacks was on the King David Hotel, the site of the British military command and the British Criminal Investigation Division. This location was chosen because a few weeks before a large quantity of documents was confiscated from the Haganah and brought there. Despite being warned by the Yishuv and told to evacuate the building the British officials decided not to cave in to the pressure. The Yishuv attacked anyway, resulting in 91 casualties, 28 of who were British and 17 who were Palestinian Jews. By 1947 the British had 100,000 troops in Palestine trying to maintain order and protect themselves. The British mandate was a major expense to the Exchequer, forcing them to present the Palestine problem to the United Nations on May 15, 1947. The United Nations proposed a partition of the British Mandate for Palestine into 2 states—Arab and Jewish (UN Resolution 181). The Jews accepted it, while the Arabs stated that they would do everything in their power to prevent it. The AHC, determined to prevent Resolution 181 from coming into effect, began to attack and besiege the Jews. The British sided with the Arabs in an attempt to prevent the Yishuv from arming themselves. Jerusalem was held under a siege with no access to weapons, food or water. The Provisional Government seemed helpless until it received a large shipment of arms from Czechoslovakia. The Haganah started fighting offensively from April through May. The Haganah mounted a full-scale military plan, Operation Nachson. After much fighting and the crucial construction of a new road from Tel Aviv to Jerusalem, the siege of Jerusalem was broken, allowing supplies to be brought into the city. This operation's success helped Harry S. Truman recognize that the Jews would be able to protect themselves. 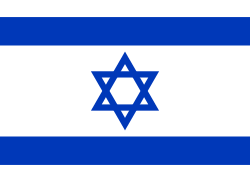 The United States decided therefore, it would support the establishment of a Jewish state. On May 14, 1948 the Jews proclaimed the independent state of Israel and the British withdrew from Palestine. The 1920 Nabi Musa riots left four Arabs and five Jews killed, with 216 Jews and 23 Arabs wounded. The majority of the victims were members of the old Yishuv. About 300 Jews from the Old City were evacuated following the riots. During the Jaffa riots in 1921, thousands of Jewish residents of Jaffa fled for Tel Aviv and were temporarily housed in tent camps on the beach. Tel Aviv, which had previously been lobbying for independent status, became a separate city due in part to the riots. However Tel Aviv was still dependent on Jaffa, which supplied it with food and services, and was the place of employment for most residents of the new city. Following the 1929 Palestine riots, which left 133 Jews dead, the Jewish community members of Gaza and Hebron were ordered to evacuate by the British forces, in fear of their security. During the Arab revolt of 1936-1939, the Jewish residents of Akko were ousted from the city by local Arab residents. The same fate was forced on the ancient Jewish community of Peki'in. The Assembly of Representatives was the elected parliamentary assembly of the Jewish community in Mandatory Palestine. It was established on 19 April 1920, and functioned until 13 February 1949, the day before the first Knesset, elected on 25 January, was sworn in. The Assembly met once a year to elect the executive body, the Jewish National Council, which was responsible for education, local government, welfare, security and defense. It also voted on the budgets proposed by the Jewish National Council and the Rabbinical Council. The most notable Jewish paramilitaries in the British Mandate of Palestine were the Haganah, the Irgun and Lehi. In October, 1945, during the Jewish insurgency in Mandatory Palestine, those organizations joined to form the Jewish Resistance Movement. It was established by the Jewish Agency and activated for some ten months, until August, 1946. The alliance coordinated acts of sabotage and attacks against British authorities. ↑ Destruction and Reconstruction - the Jewish Quarter. For the 400 years of Ottoman rule in Jerusalem there was a Jewish community living inside the walls of the Old City. The community, which we call the “Old Yishuv,” was not a single, cohesive unit. Until the early 19th century the community consisted mainly of Sephardic Jews, descendants of the exiles from Spain with Ashkenazi (Hassidic and Mitnagdim) and Mizrahi Jews in minority representation. Beginning with the mid-18th century Ashkenazi Jews begin to settle in the city, but not for extended periods. ↑ Abraham P. Bloch, One a day: an anthology of Jewish historical anniversaries for every day of the year, KTAV Publishing House, 1987, ISBN 978-0-88125-108-1, M1 Google Print, p. 278. ↑ Baron Edmond James de Rothschild. Jewish Virtual Library. 1 2 "Woodhead commission report". (p. 236) FINANCE...we found that it was impossible, whatever boundaries we might recommend, to set up an Arab State which should be self-supporting.... deficits of £P.610,000 per annum for the Arab State (including Trans- Jordan) and of £P.460,000 per annum for the Mandated Territories, but a surplus of £P.600,Q00 per annum for the (p. 237 ) Jewish State. We have found that it is not possible to call upon the Jewish State for a direct subvention to the Arab State, and neither practicable nor equitable to set up an Arab State with a budget so very far from being balanced. We conclude that, if partition is to be carried out, there is no alternative but that Parliament should be asked to provide, in some form, sufficient assistance to enable the Arab State to balance its budget. (p. 246)...CONCLUSION ... The question whether partition is practicable involves considerations of two kinds : practical and political. The former concern chiefly finance and economics ;.... But the financial and economic difficulties, ..., are of such a nature that we can find no possible way to overcome them within our terms of reference. ... we have proposed, ... a modification of partition which, ... seems to us, subject to certain reservations, to form a satisfactory basis of settlement, if His Majesty's Government are prepared to accept the very considerable financial liability involved. There remain the political difficulties. .... But there is still the possibility that both sides may be willing to accept a reasonable compromise. ↑ Statement by His Majesty's Government in the United Kingdom, Presented by the Secretary of State for the Colonies to Parliament by Command of His Majesty November, 1938. ↑ Segev (2001), pp. 127–144. ↑ Segev, Tom (1999). One Palestine, Complete. Metropolitan Books. pp. 173–190. ISBN 0-8050-4848-0. ↑ NA 59/8/353/84/867n, 404 Wailing Wall/279 and 280, Archdale Diary and Palestinian Police records. Wikimedia Commons has media related to Yishuv.